22. She can’t think of many successful precedents for brother-sister acts. “I mean, you had Karen and Richard (Carpenter), but Richard never talked. (She whispers) Which would have been a nice thing for Donny to do… No! I’m so teasing.” She laughs. “Donny & Marie” opened last night and was exactly what anyone familiar with the duo would expect. So predictable is the tour through their career that much of the show is aided by archive footage projected behind them so Donny and Marie can perform along with everyone from Stevie Wonder to duets with their younger selves. After coming out together at the opening, each is given a solo showcase that reaches absurd levels of indulgence, as when Marie sings opera and Donny plays piano. While the solo sections are composed mostly of songs made famous by others (including the Andrew Sisters and Andrew Lloyd Webber) this is followed by Donny and Marie coming out together for a run-through of their own nearly forgotten hits. Donny and Marie are professionals who effortlessly toss off their lame dialogue. Almost everything –choreography, song selection, costumes — could have been called cliche by the early ’80s. The most current event mentioned: a request for a song from Bob Hope dating back to Desert Storm. Yet, Donny and Marie are able to earnestly peddle all of this staleness with total competence and sincerity; Donny can laugh on stage when Marie jokes about being 29 like this was the first time someone her age thought to make such a crack. And Marie is able to rise to the challenge from her brother to a dance contest when he is ostensibly jealous of her television appearance. The back-up dancers prove by far the most talented performers. But this sort of scripted sibling rivalry is what fans of the duo want to see, and they are fully rewarded by this show. This is also a show you can bring the kids to. The show offers the most covered showgirls on the Strip. In fact, I am told they are not showgirls but dancers. Making this distinction to me must be important because these days the word “showgirl” is generally used to mean the women who dance in shows on the Strip. The only real surprise is how very successful this all is turning out to be during one of the worst economic periods the Strip has ever seen. I hear pre-sale has been amazingly strong. And the fans’ dedication was obvious. Many brought dolls and old records. 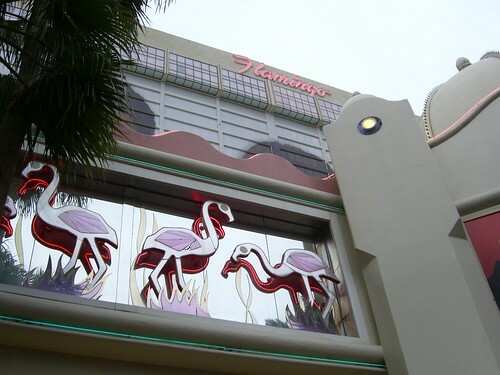 Whatever I think of “Donny & Marie,” every indication is that the Flamingo is going to be rewarded for playing it safe with this show. Of course, nothing of the licentious world of drinking, gambling and other adult entertainments that keep Vegas going is to be found in “Donny & Marrie.” Yet, Vegas apparently has enough tourists passing through to keep a showroom full out of nostalgia or a desire for predictable entertainment from this warhorse duo who prove able to pull off a blandly competent show of innocuous entertainment that has nothing special to recommend it outside the fame of the stars.